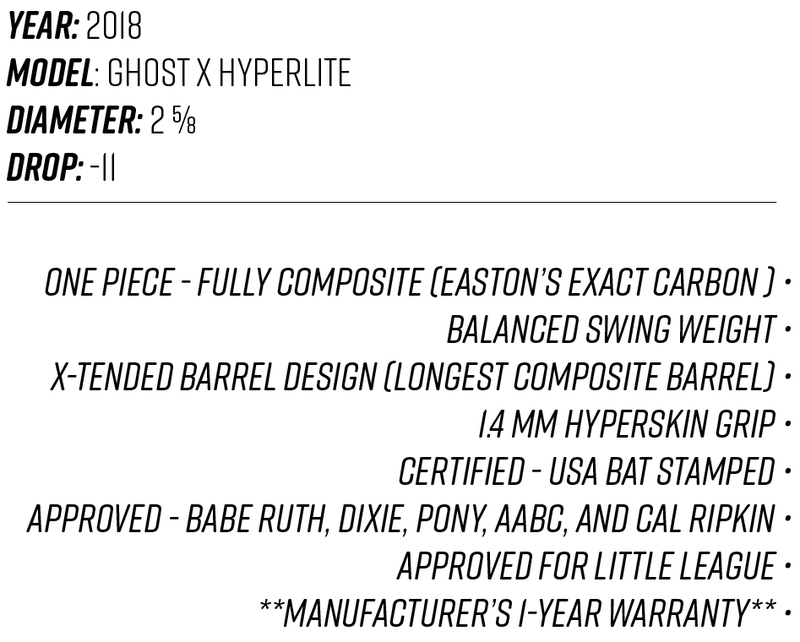 SUMMARY: The 2018 Easton Ghost X Hyperlite youth bat features all the innovative Easton technologies found in the Ghost X with a few variations. The primary difference between the two youth baseball bats centers around the actual configuration of the composite material. While the Ghost X (-10, drop -8, drop -5 drop) houses a 2-piece composite construction synced together by Easton’s revamped CONNEXION TECHNOLOGY, the Ghost X Hyperlite encompasses a single piece composite construction for those hitters who prefer a faster collision on the baseball. Being a single piece youth baseball bat, it carries less density in a hitter’s swing thereby making it ideal for those youth players who prefer a quicker/ faster swing over a heavier one. The Hyperlite also features Easton’s EXACT carbon composite material that provides youth baseball players with an enlarged sweet spot, stronger durability, and unmatched shock vibration protection. The 2 5/8 barrel utilizes Easton’s new X-tended barrel design making the Ghost X Hyperlite the longest composite bat in USA Baseball. Lastly, the EXACT carbon handle comes pre-wrapped with Easton’s 1.4mm HYPERSKIN grip distributing supreme comfort for your youth ball player. The 2018 Easton Ghost X Hyperlite was developed for hitters who are smaller in stature or those that prefer a quick bat with a single piece configuration. VIBRATION CONTROL: Single piece construction youth baseball bats like the Ghost X Hyperlite are expected to channel less vibration control than 2 piece construction youth bats. During our review, our hitters reported the same rate of vibrations as the leading Ghost X -10 drop. The Hyperlite did a great job protecting our volunteer youth hitters from the stinging vibration that is bound to occur on occasion. Remember, the scoring of this category is solely based 100% upon the feedback from our youth hitters. Our staff has no other way of judging vibration control other than documenting the hitter’s feedback. Our volunteers consistently gave the Easton Ghost X Hyperlite a score of 8 or 9 out of 10. DURABILITY: The most impressive feature our staff witnessed regarding all the Ghost X models came down to the durability of the composite barrels. We have officially documented approximately 250 contact swings with the Ghost X Hyperlite showing only typical handling marks and scratches but nothing that would impair performance or eligibility of the youth USA bat like dents or cracks. OVERALL EXPERIENCE: Overall, the 2018 Easton Ghost X Hyperlite -11 is not meant to deliver the maximum pop for the USA bat evolution. The Hyperlite was specifically designed for youth hitters who prefer the composite bats yet might not have the skills, strength or size to swing a Ghost X with a -8 or -5 drop. This bat was surprisingly voted upon as the 2nd most favored 2018 Easton youth USA bat at the conclusion of our evaluation day because of its great mix of speed, comfort, and power. Buy your 2018 Easton Ghost X Hyperlite youth bat now!